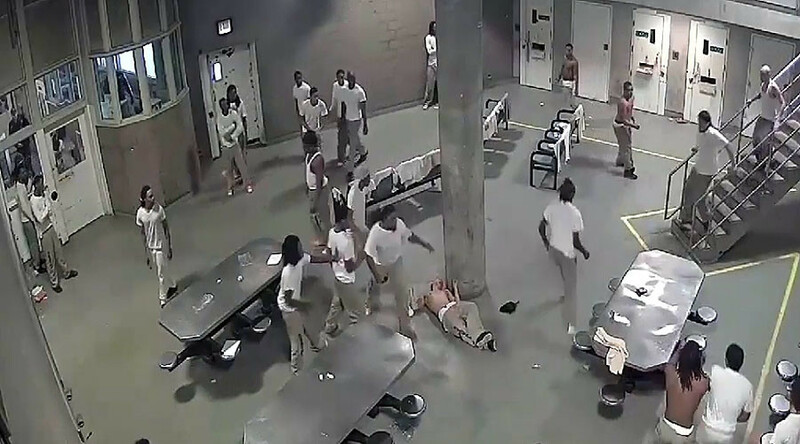 A brutal brawl captured on security cameras has left five inmates seriously injured at Cook County Jail, the largest jail in the US. The vicious melee broke out in a common room at the Chicago state correctional facility on Friday. CCTV footage shows violent skirmishes taking place between inmates for more than a minute before guards intervene brandishing tasers. Some 30 inmates were in the room at the time. It is unclear from the video what caused the frenzied fighting, which saw one man knocked unconscious with a single punch and another shanked in the back. A number of implements were recovered following the incident, including makeshift weapons made from inhalers, report the Chicago Tribune. “It was brought under control quickly, but we do have five inmates who suffered injuries,” said Cara Smith, a Cook County Jail spokesperson. The injuries are not thought to be life-threatening. Cook County Jail holds approximately 100,000 inmates each year and primarily contains people awaiting trial. It is the largest single site detention facility in the US. Div 9 01-06-17 from Cook County Sheriff on Vimeo. Last October, a fight in the same area of the facility saw inmates and guards clash violently. Div 9 Incident from Cook County Sheriff on Vimeo.